Follow the clues the rats leave behind as they feast on orange trees. At one time, three color variants of roof rats were recognized. Roof, gray-bellied or Alexandrine rat, Rattus rattus alexandrinus. Black or ship rat, R. rattus rattus. White-bellied rat, R. rattus frugivorus. These are no longer considered to be valid subspecies because all of these color variants interbreed. What is interesting, however, is the name frugivorus indicates this group feeds on fruits. Over the years, I have had customers who insisted on referring to roof rats as fruit rats because their experiences with this rodent in southern California have been of these animals depredating fruits in backyard trees. The roof rat is essentially an arboreal species that travels and navigates dexterously in trees, shrubs, vines and other woody ornamentals. It has extra footpads on the bottom of its feet that enable it to maintain footing on narrow vines and branches. Its tail is longer than its head and body combined — and although it’s not prehensile (capable of grasping), the tail aids in balancing when this rodent navigates in high locations and travels on wires. Early this spring, I began to notice hollowed-out Valencia oranges under one of my backyard trees (see Fig. 1). I examined a number of these oranges, and had some difficulty figuring out who was responsible for the damage. I knew what pest it wasn’t: In the past, a possum had visited our yard at night and eaten some orange fruits that had fallen to the ground. A possum has 50 teeth, which is more than any other land mammal. Eighteen of these are incisors, which are located in the front of its jaws. These teeth did not evolve for the purpose of eating fruits. As a result, possums are messy eaters when they try to eat citrus fruits. This time around, the oranges were picked clean. I also knew it wasn’t a bird. Fig. 2 shows four citrus fruits on the left that were damaged by roof rats. The nectarine on the right was damaged by a house finch (Carpodacus mexicanus), one of the most injurious bird species of soft fruits in California. Note the peck marks on this fruit. “Beakers” tend to leave distinctive peck marks on damaged fruits, as opposed to teeth marks left by rodents. It is easy to get sidetracked when observing and examining damaged fruits on the ground, and this can lead to inappropriate placement of control devices such as snap traps (see Fig. 3). Remember the old adage: If the diagnosis is wrong, the prescription will be wrong. The traps shown in Fig. 3 were deployed at dusk and retrieved at dawn. Their intended target was a nocturnal animal, and they should not be set out unprotected as shown during the day, as they might injure non-target diurnal creatures such as birds. These traps were baited with raisins to minimize exposure to carnivores, such as free-ranging domestic cats. Traps set on the ground in this case were not effective, despite being deployed in this manner for more than a week. It was not until later that I discovered some freshly damaged fruits still hanging by their stems in the tree. I realized then that this culprit was eating fruit in the tree, not feasting on fruit that had fallen on the ground. Fig. 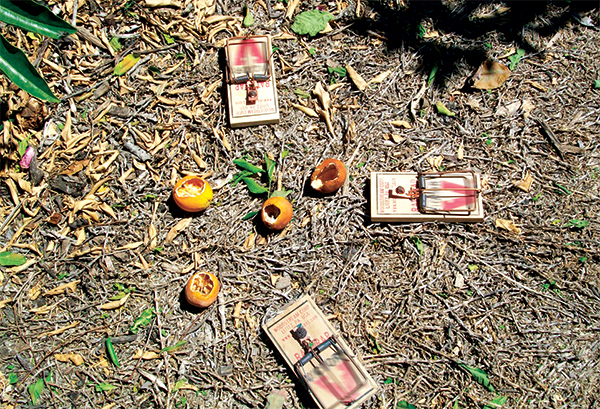 3 Traps are deployed around damaged fruits on the ground. I have four citrus trees in my backyard that are adjacent to a rear concrete block wall. The rats causing this damage were walking on top of the wall and accessing the tree in question from there. They never traveled on the ground, and traps set in a circle around the tree trunk and damaged fallen fruits on the ground never intercepted them — because, at the time, I hadn’t considered rats to be a suspect. There are plenty of fruit trees in this neighborhood, with limbs that are touching property fences. Thus, rats have no need to travel on the ground to look for fruit. The tops of fences are highways for arboreal, nocturnal animals such as rats. By using fences to traverse their territory, they obtain some protection from ground-dwelling predators such as domestic cats and dogs. To intercept these miscreants, snap traps had to be set in the tree. This is not easy to accomplish, because citrus trees have sturdy limbs that easily scratch and inflict puncture wounds on human skin. It is best to wear a sturdy pair of coveralls when working in these trees. A trap deployed in a tree has to be properly secured so that if a rat steps on it, it will not become unbalanced — causing the animal to recoil from it or setting off the trap. This kind of encounter will also result in trap shyness. Traps had to be tied to limbs and branches using wire and sturdy strings to hold them in place (see Fig. 4). It is not easy to deploy these traps because it is often necessary to set them above eye level, making it difficult to see what you are doing. You have to take proper precautions so as not to let the kill bar inadvertently come down on your fingers when positioning traps in trees. Fig. 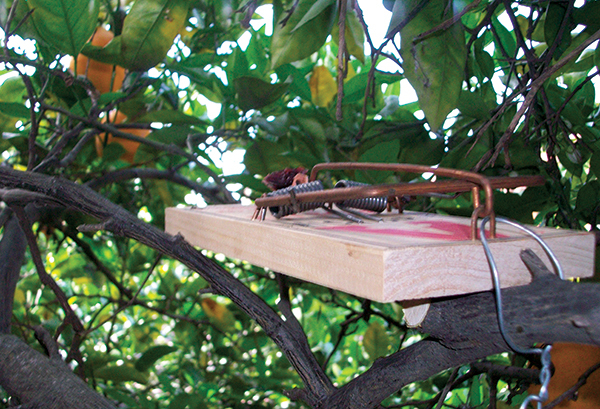 4 A trap is positioned in a citrus tree. You also have to make sure that when a trap deployed in a citrus tree is set off, the kill bar has an unimpeded path to its target. Otherwise, it will hang up on a limb or branch, rendering it ineffective. You can use a pruning shear to snip off small branches as needed to allow the kill bar to have an unhindered path to its target. After a few days of tree trapping, my yard was no longer a haven for roof rats. Dr. Hanif Gulmahamad, BCE-Emeritus, PCA is a pest management consultant based in Ontario, Calif. He may be reached at entodoc@verizon.net. 1 Comment on "Trapping roof rats with a sweet tooth"
Great article with lota of good learning. But where are the photos of the dead rats in the traps? ?